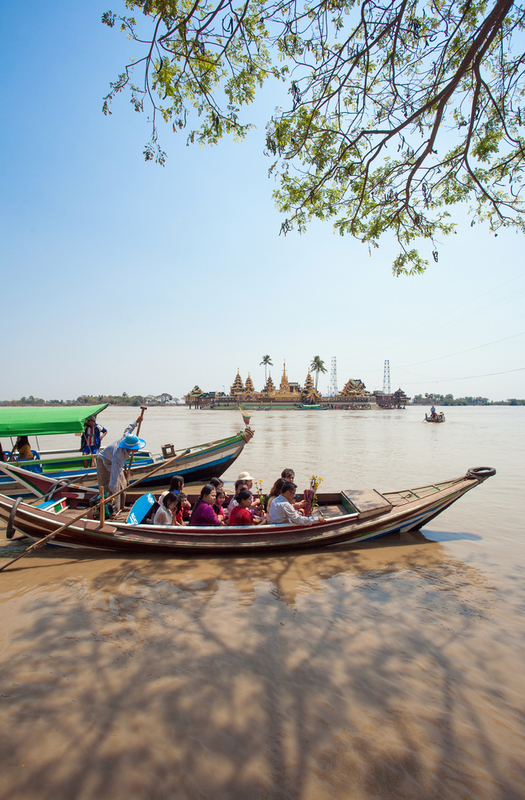 Gary Buchanan takes a trip back in time on a luxury river cruise that follows in Kipling’s footsteps along the Road to Mandalay – for part of the way at least. Like many miraculous tales about Buddha I have gleaned on my travels in the Orient, the story of the Thadingyut Light Festival has been handed down through generations. 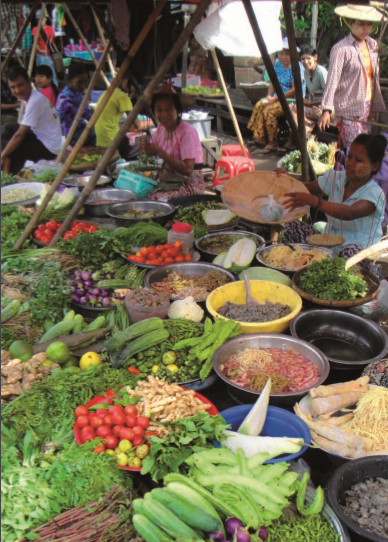 This celebration commemorates the return of the ‘enlightened one’ and occurs as the monsoon rains retreat in the seventh month of the Burmese lunar calendar when the entire nation pays homage. My visit to this enchanting country coincided with the festival in October when the full moon reached its highest elevation and every pagoda and stupa blazed with light. Even in the most rustic villages every house was lit by rows or circles of candles and oil lamps crafted from earthen saucers. Arriving in Yangon a few days earlier the immigration official returned my passport like a sacred writ. The flight from Bangkok took an hour but the time difference between the two cities could be measured in decades. Nakedbulbs illuminated vignettes of local life: men fixing tyres, chickens dangling from hooks, and aromatic fast-food simmering under oil lamps in roadside stalls. It was a scene barely touched by the 20th century, never mind the 21st. Shortly before dawn the next morning I met my fellow travellers as we gathered at Yangon Airport’s domestic terminal. The representatives from Belmond were on hand to take care of luggage and distribute boarding passes for the Asian Wings flight north to Bagan. Thus began a voyage to landscapes that palpably fed the soul. After landing, our happy band was transported along dust-red tracks to reach our floating idyll for the next week. 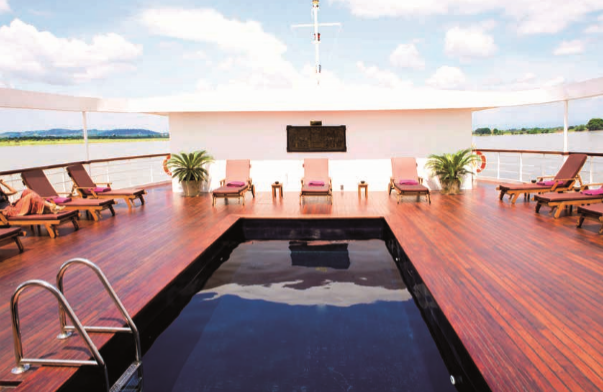 Purpose-built at the Thein Phyu Shipyard in Yangon in 2013, this recreation of an Irrawaddy Flotilla Company ship has a contemporary, elegant interior which is flooded with light from picture windows. Taking its name from the small, beakless dolphins that inhabit the rivers of southern Asia, Orcaella accommodates 50 guests. There are two Balcony Suites, a Junior Suite, 13 State Cabins and 9 Deluxe Cabins – each boasting comfortable Sealy beds positioned to take full advantage of the enchanting scenery through the floor-to-ceiling glass window. A spiral staircase of local Pyinkadoe wood connects the three passenger decks where the design palette is a mélange of the Occidental and Oriental. The Restaurant, with its nod to minimalism, evokes a recherché Parisian boutique hotel. The Lounge Bar with its cream bar stools, chocolate-leather chairs, Burmese lacquer-ware, and small library makes a convivial focal point for life on board. There’s also a swimming pool surrounded by sun-loungers, fitness centre and spa on Observation Deck; a boutique and fine-wine cellar on Main Deck; hair salon and medical facility on Lower Deck. Our first excursion explored Bagan, former capital of the Burmese empire and spiritual heart of Myanmar. 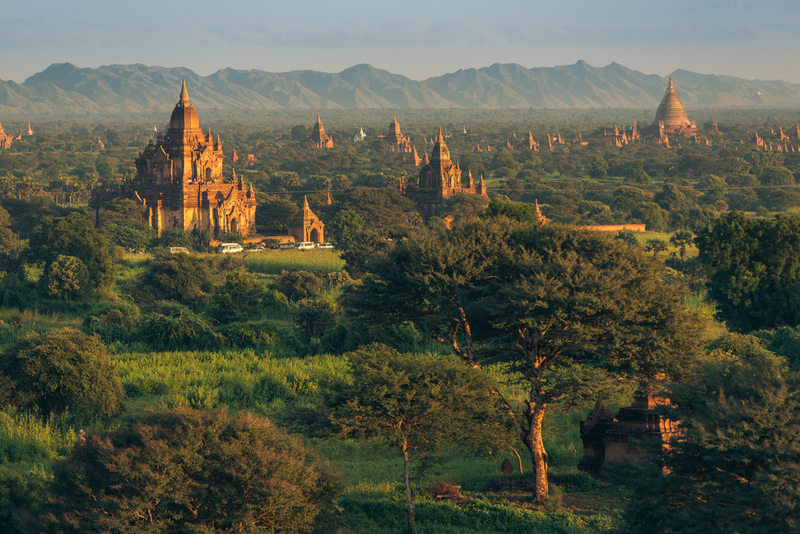 From the 11th century until its rapid decline two centuries later, devout Burmese monarchs built more than 4,000 temples across a 20 square-mile swathe of a parched-earth plain. Though many of the original pagodas have crumbled into oblivion, there are still thousands rising from the umber terrain. In this ghost city, slim, white edifices contrast with stocky, red-brick tetragonal monuments; some soaring 180 feet high, with elaborate terraces, porticos and bas-reliefs. The sun sank peacefully towards the western horizon like a benevolent god taking his leave, and a spectacular sunset was revealed as streaks of scarlet and amethyst faded in the sky. Adding to this vision of rapture was the haunting resonance of monks chanting Buddhist scriptures. 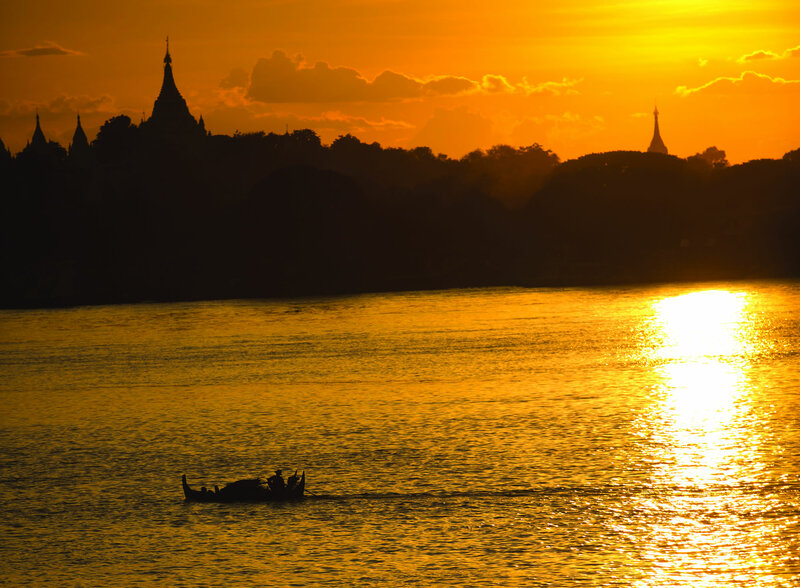 The next day we began our slow, meandering passage south along the mighty waterway whose name is derived from the Sanskrit for ‘Elephant River’, The Ayeyarwady has shaped Myanmar’s history and is the country’s economic lifeblood. Puttering cargo boats convey their wares from one hamlet to another against a wistful backdrop of hills interspersed with inviolate golden stupas. Children swim as their mothers go about their ablutions before pounding their laundered clothes on the rocks. Young men in longyis and conical hats search for fish in canoes that resemble ancient coracles. It’s a time-worn scene that would be instantly recognisable to Kipling and Maugham. During our excursions to ancient towns and bucolic settlements, it became evident that a breeze of freedom is rejuvenating the Burmese people. This fresh energy and excitement beams from the very demeanour of these gracious people who today have freedom of expression after being secluded for generations in a cage of frustration. of any luxury resort. Life on board is by design, laissez-faire and my fellow guests were intrepid yet jovial Europeans, Australians and Americans. Cuisine is created by Executive Chef Bansani and her team of six chefs. Breakfast is served buffet-style, cooked dishes can be ordered from the obliging waiters. Lunch comprises a variety of fresh, Oriental salads, soups and authentic hot dishes served from the central buffet. Asian and European specialities feature on the dinner menus and are nothing short of a triumph. I savoured Pan-Fried Foie Gras; Wagyu Beef Tenderloin; a selection of cheeses; rounded off with a Chocolate Fondant. Other nights I enjoyed Yam Som O (Grilled River Prawns with Pomelo, Lemongrass, Coriander Leaf, Onion, Pumpkin Seed, Ground Peanut, Roasted Almond with a Crispy Garlic and Honey-Lime Dressing); Pan-Fried Tuna with Sautéed Asian Vegetables served with Steamed Rice and Soya Garlic and Ginger Sauce; topped off with a delicious Mango Soufflé with Coconut Ice Cream. On the night of the full moon a lavish buffet dinner was served in the impressive bastion of Min Hla Fort, site of a momentous battle during the 3rd Anglo-Burmese War in 1885. The dreamy surroundings were made even more spellbinding as the parapets were highlighted by countless candles. As we returned to Orcaella the inky-black sky took on a celestial glow as hundreds of flickering Shan balloons glided into the astral firmament. As my 428-mile odyssey came to a close the landscapes assumed a more industrial persona. Our passage through the Twante Canal that connects the Ayeyarwaddy with the Yangon River offered vignettes of sunlit villages where pagodas were packed in more tightly than pubs in an Irish village. 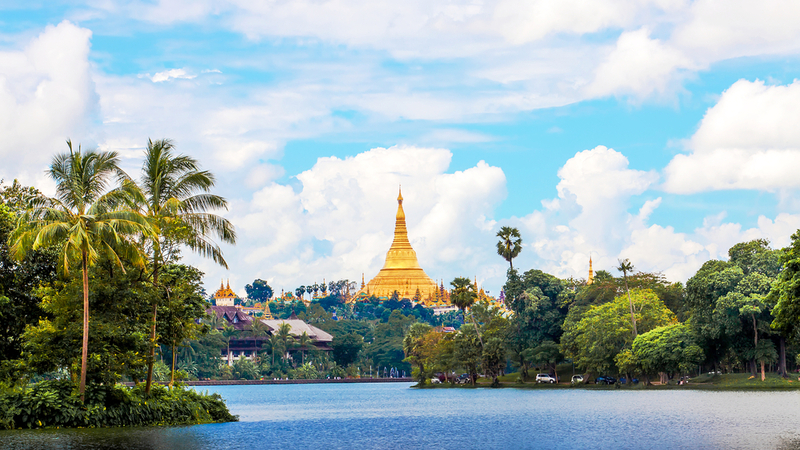 Like pages from a Conrad novel, Yangon is a desultory port where dust and humidity coexist. An obliging steward brought me a cold drink on the Observation Deck as I surveyed the frenetic scene: entire families perched on revvedup mopeds boarded ferries, crates were bundled onto dilapidated trucks, an ominous rumble of thunder in the distance; it was a cacophony of what passes for daily life in this beguiling outpost. I retreated to the serenity of Orcaella one last time before leaving in a Burmese daze.